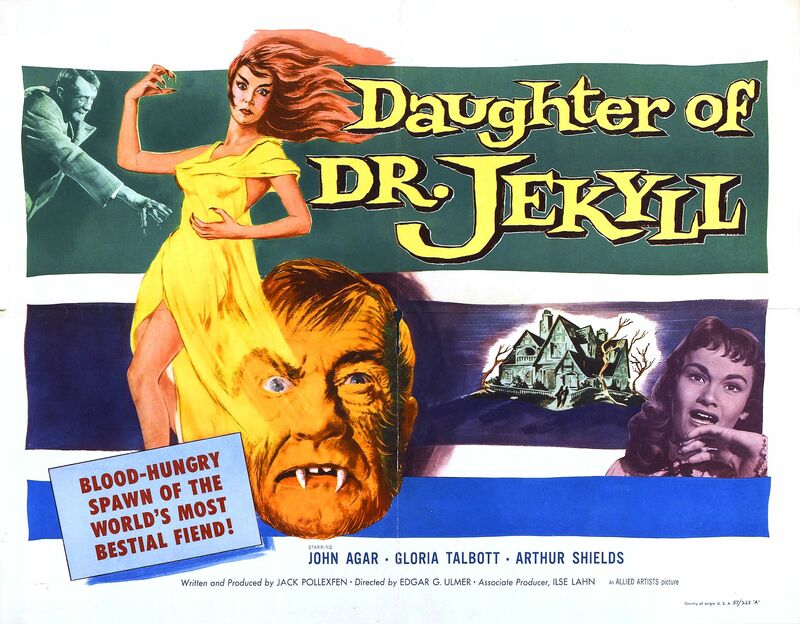 On her 21st birthday, a young woman (Gloria Talbott) brings her fiance (John Agar) to the home of her guardian, Dr. Lomas (Arthur Shields), who tells her a dark and devastating secret: she is the daughter of the infamous Dr. Jekyll, and may have inherited his violent proclivities. Talbott calls off her engagement and begins having terrible nightmares — but is she responsible for the recent spate of murders in the village? B-level director Edgar Ulmer helmed a handful of beloved cult classics — including Detour (1945), Bluebeard (1944), and The Black Cat (1934) — as well as lesser efforts like this mash-up of Dr. Jekyll and Mr. Hyde with werewolves and vampires. 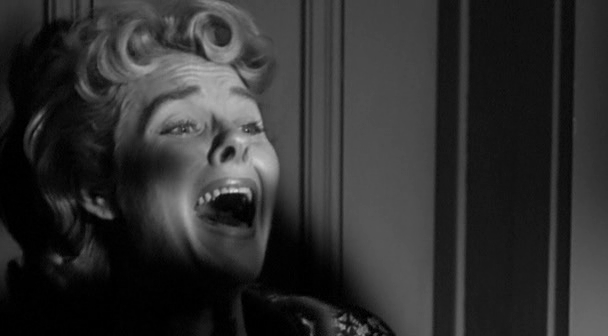 As in her best-known film — I Married a Monster From Outer Space (1956) — Talbott is nicely cast as a vulnerable woman made crazy and paranoid by the men around her, and Shields is fine as a seemingly kindly guardian with nefarious ulterior motives. 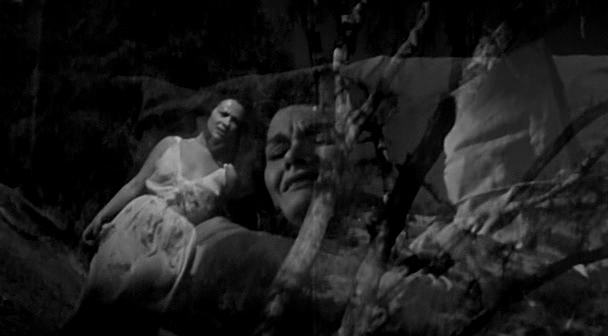 The film’s primary problem is that the “mystery” is broadcast in the opening teaser, as we see Shields transforming into a werewolf-like Mr. Hyde and chortling at the camera; there’s really no question that he will ultimately be exposed as a murderous, monstrous crook. With all that said, this is a swiftly paced B-flick with atmospheric cinematography, and worth a one-time look by fans of Ulmer’s work. No, but it’s worth a one-time look. Listed as a Camp Classic in the back of Peary’s book. Just about every hackneyed line of dialogue for this type of film is on parade here. This is pretty much an embarrassment – with no camp value whatsoever. The only thing of note, really, is watching B-actress Talbott trying very hard to breathe some life into a hopeless piece of crap movie. A little sad to see Shields – a memorable presence in a number of classic ’40s films – reduced to this. But it seems all those involved really needed a paycheck. The last 10 minutes suddenly perk things up some…but not enough to make it worth the wait…or the watch.